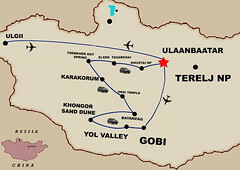 The tour begins with a flight to Bayan-Ulgii province, the home of the Kazakh people, located in the westernmost part of Mongolia. While Kazakhs can be found in other countries, only Mongolian Kazakhs have preserved their unique culture and traditions such as eagle hunting. The landscape is very different in this part of Mongolia. We'll visit the Gobi Desert where you'll be surprised to find that it is not at all as you may have imagined. We'll see abundant wildlife in the Yolin Am Valley, search for dinosaur bones at the famous Flaming Cliffs, spend time with a camel herder family at the Khongor Sand Dunes, ride Bactrian camels, and enjoy climbing to the top of the Singing Dunes. We will continue on to the city of Kharkhorin, the center of Asia 800 years ago. Although it lost its splendor long ago after enduring several battles, the former Buddhist religious center of Mongolia, Erdene Zuu Monastery, is a very interesting place to pay a visit. The monastery was built using the bricks and stones of the ruins of the 13th century capital city. We then take you to Tsenkher Hot Spa in Arkhangai province where you can rest by soaking in a natural hot spa surrounded by forested mountains while having your favorite drinks and gazing at the millions of stars in the night sky. This is also a good place to enjoy a relaxing ride on a horse. The final leg of your journey is Hustai National Park where wild Przewalski horses are successfully being reintroduced to Mongolia. You will learn all about the horses as well as the other animals that inhabit the park. The whole tour will be an incredible experience that you will always cherish. We will work with all our hearts to give you an enjoyable stay in our beautiful country, Mongolia. 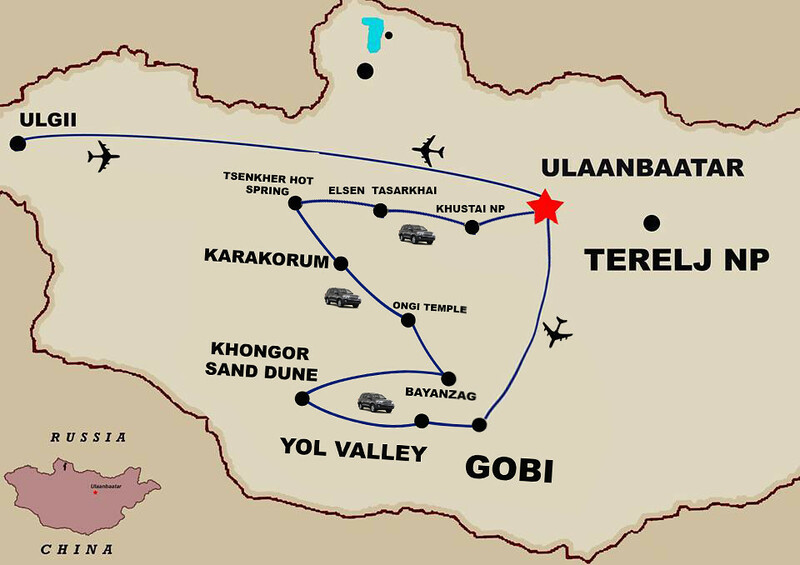 Transfer to the airport for a morning flight to Ulgii (2.5 hours), capital of Bayan-Ulgii,Mongolia’s westernmost province. Ulgii (or Ölgii) is the capital of the Bayan-Ölgii Aimag (province) located in the extremewest of the country. It has an altitude of about 5,600 feet and population of about29,000. It is the largest town in the area. It is the center of the predominately Kazakhregion of Mongolia. The isolation of the Altai Mountains has preserved the language andtraditions of the Kazakhs, who live amongst some of the most spectacular scenery inMongolia. We will visit Kazakh families in their settlement. Their Gers are slightlylarger than Mongolian Gers, and are decorated with brightly colored rugs. WWe will enjoytheir hospitality and friendliness and learn more in deep about their culture. You will seetheir traditional technology to make colorful rug. A visit to the well regarded provincial museum should provide a good overview of theMuslim culture of Western Mongolia that differs so much from most of Mongolia. We will be visiting some of the nomads of the area and experiencing their unique lifestyle.Kazakh craftswomen are renowned for their colorful embroidery and textiles, and their gers are beautifully decorated. Handcrafted felt carpets line the floor, and delicately embroidered tapestries adorn the walls of their homes, with each design unique to a particular family. This morning we fly over vast steppe to the Gobi, Mongolia’s southernmost province of semi-arid desert. Meet your local guide and driver and then transfer by4WD vehicle to the Yol Valley in Gurvansaikhan National Park, situated in the lap ofAltai Mountains. On the way to our lodge, we stop to visit the local Natural History Museum for an insight to the flora and fauna of the area. Today you'll drive to the ruins of the Ongi monastery. It was the largest Buddhist center in the Gobi region. There are 2 complexes of temple ruins which were built up in 1780s. During political repressionin 1930s’ these two temples were destroyed and many lamas were executed and imprisoned. Visit Ruin of monastery reconstructed parts. On the way visit basin of the Ongi river which is dried out because ofmining activity. After breakfast at the tourist camp, drive to Karakorum, the symbolic ruins of the 13th century capital of the Mongol Empire. On the way, you may stop for an optional camel ride in the sand dunes of Mongol Els. Mounted on the double hump camel, you can wander about the sand dunes and visit the nomadic camps in the area. In Karakorum, we will visit Erdene-Zuu, the oldest monastery, with 108 stupas, built in 1586. The monastery was built of the remains of the ancient Mongolian capital. Next, we will visit the Karakorummuseum and see the Great Mongol state period, Stone Age, Bronze Age, Ancient state period halls. Following breakfast at tourist camp, we will drive to Tsenher hot spring. Along the way we will stop fora break in the small town of Tsetserleg to visit a monastery museum. We spend overnight in a ger camp based at natural hot springs. Soak in hot water; enjoy a hike in the hills. 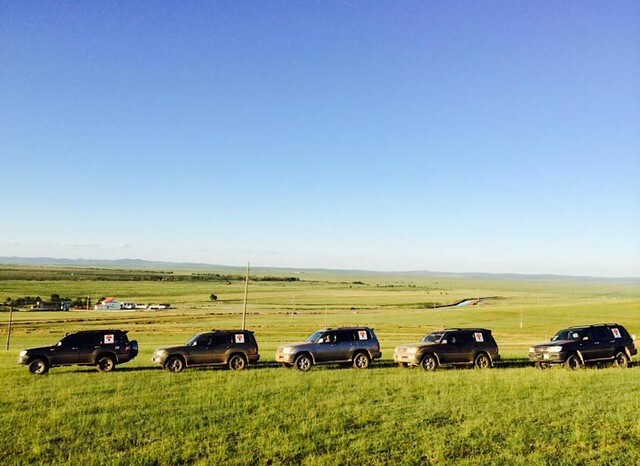 In the morning, drive out to Ugii Lake with stops at Turkish monuments in the Orkhon Valley. These monuments are dedicated to the Turkish Princes Kul Tegin and Bilge Khan, brothers who were famous for their military bravery. Continue on to Ugii Lake, one of the largest fresh-water lakes in Mongolia, known for its migratory birdlife such cranes, ducks, geese, and pelicans and for its variety of fish.After a lunch break, drive to Elsen Tasarkhai, stopping to pay a visit with a nomad family and learning how they live and make dairy products. You may even have a try at drinking fermented mare's milk. After a leisurely breakfast, head out on the drive to Hustai National Park , the site of a unique re-introduction of Przewalski's Horse (Equus Przewalskii), called "takhi" by the locals. It became extinct in the wild in 1969 and since 1992, has been successfully re-introduced in Hustai from zoos around the world. This has been an international effort monitored by the Foundation for the Przewalskii Horse, based in the Netherlands and MACNE (Mongoian Association for Conservation of Nature and the Environment.) The park extends through the Khentii Mountains and includes the western edge of the Mongolian steppe. It contains large patches of birch and aspen forests and visible remains of Neolithic graves. Other wildlife found here include red deer, the wolf, and Mongolian gazelle. After breakfast, drive back to Ulaanbaatar. En route to the hotel, we may visit the BogdoKhaan Winter Palace Museum. The Bogdo Khaan Winter Palace is the home of the last Mongolian King, Javzun Damba Khutagt VII. The museum contains a number of Buddhist artworks and the private collection of Bogdo Khaan, composed of gifts from rulers and kings from all over the world. The artworks displayed here were made by the top Mongolian, Tibetan, and Chinese master-sculptors of the 18th and 19th centuries andrepresent the gods of the Buddhist pantheon. In the evening you can enjoy a farewell dinner and attend the local folklore dance shows.